This model shows the harmful effects of hypertension on the most susceptible organs. It consists of scaled down depictions of: brain, eye, 2-part heart, 2-part kidney and an enlarged artery. All of the organs of the hypertension model can be rotated or removed for closer viewing. Comes with base. This model shows the harmful effect of hypertension. 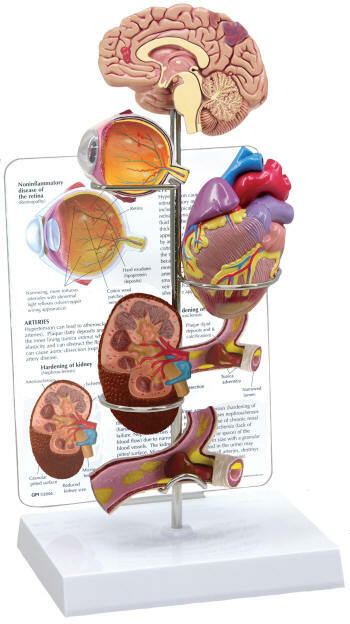 It consists of brain, eye, heart, kidney and artery models, all at half natural size, thus requiring little space for display. Come with base and helpful patient information card that covers such subjects as glaucoma, arthresclious, arterial plaque, kidney failure and stroke. The display stands 13-1/2" tall. The base has a small 6-1/2" x 5" x 1" footpring.